Crushing and sand making equipment is the key equipment in artificial aggregate production line. Its performance directly affects the quality of concrete aggregate, and influences the investment and production cost of artificial stone production system. At present, there are many manufacturers of crushing and sand-making equipment at home and abroad, with different performance and price. How to select suitable crushing and sand making equipment to ensure the operation reliability, technological advancement and economic rationality is a main subject of artificial sand and stone production system. For example, the sand production line in Hunan, China is used to process river pebbles with 400 tons per hour. The production line adopts three-stage crushing technology and consists of PE jaw crusher, HPT cone crusher, 5X sand making machine as the main equipment. The final product size is 0-5-10-20-31.5mm. 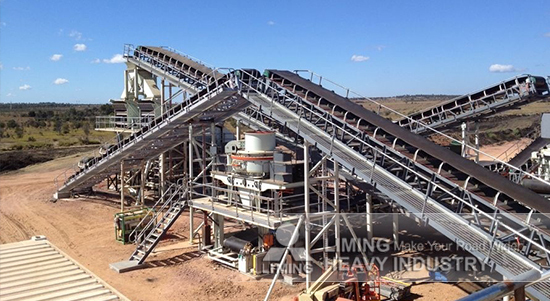 Liming Heavy Industry is a professional manufacturer producing crushing and sand making equipment. By comparison, the experts from LIMING suggests jaw crusher is selected as coarse crusher, impact crusher is medium crusher, and vertical shaft impact crusher is fine crushing and sand making. PE1500X1800 can be selected for coarse crushing, and PF1315 is selected for medium crushing, VSI5X is selected for fine crushing. According to specific circumstances, technician can make a good solution for you.